← Random Panel: The high school geek mantra. Preach it! Sorry, Inigo, I didn’t mean to jog him so hard. @Kingmonkey: Genius … sheer genius. OK, so this is the same “Bulletman” comic where a cop can’t recognize his own daughter because she’s wearing a silly bullet-shaped helmet (but no mask), Bullet Girl lets a freakin’ TANK sneak up behind her, and one of the bad guys is nicknamed “Limpy” because (Surprise!) 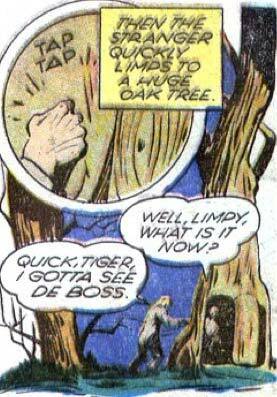 he limps. Somehow I’m sensing that the creative minds behind this little classic weren’t exactly the sharpest knives in the drawer. Limpy has a load to drop! Tiger just shook hands with El Prezidente.